Run out of a new TV series to binge watch? How about catching up on all the online Howwows in one go. 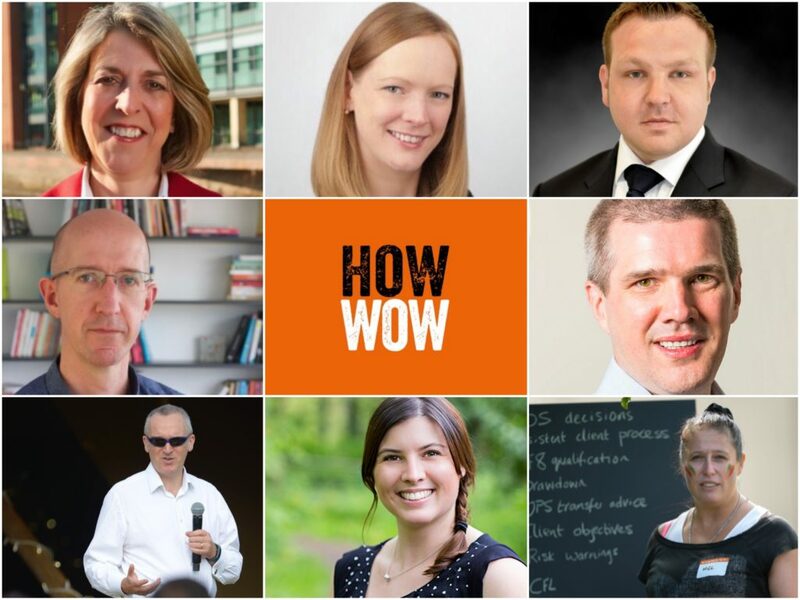 In our monthly online Howwow, gurus and paraplanners share top tips and best practice on current topics. Most folk tune-in and ask questions on the day, but for those times when you can’t make – or if you just want to watch it all over again – we’ve recorded it. So, go on and have watch – it’s like netflix for paraplanners! January Howwow: MiFID II & Costs – What happened next…? Looking at the practical implications and issues of finding accurate information, the various anomalies, how to report it and paraplanning experiences so far. Our panel had already posted some blog pieces. On trading cost anomalies and negative costs catch Nathan Fryer’s piece here. Read Mike Barrett’s MiFID II reality check here and excellent reporting of what’s happening on the ground here. February Howwow: What does GDPR mean for you? Our panel talked through how businesses measure up against the 12 ICO GDPR principles, the legal basis around processing personal data, and lots more. Due to technical difficulties the slides didn’t appear, so we’ve popped them here. Word meisters, Quietroom (of report writing Howwow fame) held a surgery on all those report writing bugbears, from writing and communication techniques, language usage, and how to proofread like a boss. Before you watch the Howwow, make sure you watch this animation first. Finished? Good. All will be revealed once you’ve watched the Howwow. April Howwow: What do the FCA papers mean for DB transfers? This month’s Howwow looked at DB transfers in light of the recent FCA Policy Statement PS18/6 and Consultation Paper CP18/7. Joined by Aegon’s Pension Director, Steven Cameron, we talked through the application of these papers and their potential to improve the quality of pension transfer advice to clients. In this Howwow our panel looked at cash slow planning from a paraplanner’s perspective with Rory Percival. We discusssed how to research and do due diligence on a tool, review it’s continued suitability, the various tools and their uses, and lots more. In 2017 we asked you what content you wanted us to try and bring to you, and you asked for more tax and trust content. So, not ones to disappoint, we’ve partnered with Utmost Wealth Solutions to bring you five episodes on Tax and Trusts, covering wrapper taxation, pension death benefits, FICs and lots more. A panel of paraplanners and Rachael Hurdman – founder of Arch inspire, shared their practical tips and experience on how to build and run a paraplannning team. This Howwow is perfect for anyone wanting tips on working within a team, anyone thinking of career development or for any team leaders or managers out there. Joined by paraplanners who work from home full time, part time and even Canada, we talked through top tips for the day-to-day managing of work-flow, as well how to successfully work from home. With experts in the field of later life planning, we tackled this important issue that is becoming more and more relevant for clients with the increased longevity and greater awareness of care fees. The Howwow for anyone thinking of setting up and running an outsourced paraplanning business – covering what you need in order to set up to how to stay on top of CPD. There’s also a useful blog post accompanying this Howwow click here. As a relatively new role within financial services, we discussed the training, recruiting and the career opportunities for the new generation of paraplanners. Rory Percival – former Technical Specialist at The FCA, frequent contributor at conferences and the Powwows, talked best practice on topics such as DB transfers, evidencing suitability, and risk profiling tools. You’ll find a copy of notes Rory’s Howwow here. Carol Wells, Head of Wills, Trusts and Estate Planning at Abbey Tax and an expert speaker on this topic. Carol talks us through the technical aspect of RNRB including, relief limits, impact on trusts, and downsizing rules. Once you’ve watched the Howwow, head to blog and download a copy of Carol’s slides here. Our exam guru, John Reynolds shares the proven techniques that deliver measurable results in exams. His research uses predictive modelling to support the development of today’s paraplanners and financial planners, with the aim of making learning and development as effective as possible. September Howwow: What is social impact investing? We discussed the emerging field of social impact investing from a paraplanning perspective. Our experts talked through the true definition of social impact investing, how to research and review funds and portfolios, and manage clients expectations. Rory Percival – the former Technical Specialist at The FCA did is second Howwow of the year on risk profiling covering the concerns the FCA have flagged in 2017 and what are firms still getting wrong. Plus we chat through the main findings from Rory’s recent research paper into risk profiling tools. December Howwow: What does MiFiD II mean for paraplanners? We rolled November and December into one Howwow. Why? Because we wanted to talk MiFID II and felt Christmas jumpers would soften the blow. The panel tackled annual cost disclosure, 10% reporting rules and suitability. What are the online Howwows? Where Powwow gatherings are on a number of topics, Howwows are for those times when we want to focus on ONE topic in depth. Sometimes we meet in person, and at times we just like a good chinwag online. Enter the Howwow online. On the tech side of things. Viewing the Howwow on browsers such as Chrome or Firefox work best. Are there more Online Howwows? You bet your bottom dollar there are, and on lots of useful topics for paraplanners. We aim to hold one every last Wednesday of the month, at lunchtime (1-2pm for most folk). Sometimes we’ll throw a curve ball and change the date. That’s because we want to bring you amazing panel members and they can’t make Wednesdays. It’s as simple as that. You can watch past Howwows by clicking the links above or on our Howwow channel. For a list of any upcoming Howwow or Powwow events here. There isn’t an upcoming Howwow listed, when will the next one be? Sorry about that. We’re just confirming the topics and putting together an A-Team panel for it. It’ll probably be the last Wednesday of the month, but to make sure you never miss a Howwow sign-up for the Powwow Post! Can I suggest a Howwow topic or be on the panel? Absolutely, the more the merrier. Drop us an email.